Well...I know it isn't the 1st yet, but I can hardly contain my October joy so I figured I'd bang out another entry. Halloween would be lacking something without the annual pumpkin patch vigil that Linus embarks on. Some of the best moments are Sally’s plea for restitution after wasting her first night of “tricks or treats" and Charlie Brown wearing his hole filled ghost costume while carrying a candy less bag - "I got a rock". This cartoon is just plain classic! Linus cast as the downtrodden gives Charlie Brown a bit of a break. 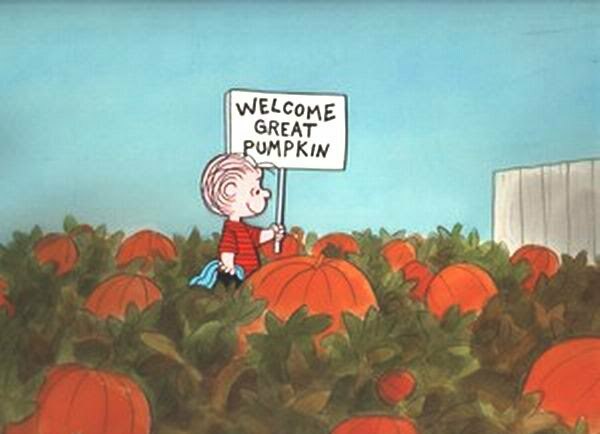 Linus spending all night waiting for the Great Pumpkin in the most sincere pumpkin patch is heartwarming. I often talk to my kids about the Great Pumpkin as I DO believe he exists. One year I grew 40 pumpkins of my own and sat in the pumpkin patch all night waiting for the Great Pumpkin to arrive. I will not admit or deny that he came that night...it is my secret. 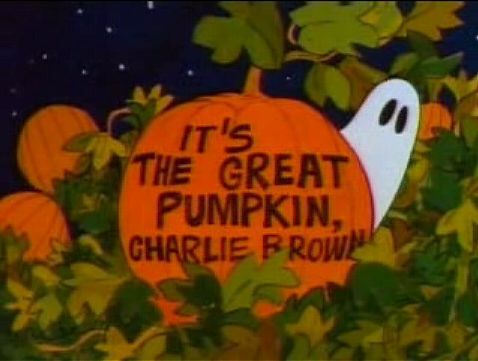 The thing I like best is Linus' resolve to continue to believe in the Great Pumpkin. It gives me hope that I am not completely insane as I too believe in the Great Pumpkin. This year I did not plant pumpkins nor do I intend on spending Halloween night waiting for him to arrive. Instead I create Pumpkinland - my home haunt in homage to him, the Great one.